I'm linking with Collaboration Cuties again, with a mentor text idea for math. This was a spectacular event last week as I read about so many books and ideas of how to use them. I can't wait to see all the math ideas (hoping someone has a great one for division or area and perimeter). This is a great little Chinese folktale by Lily Toy Hong. It's the story of Mr. Haktak and his wife. They are very old and very poor. One day Mr. Haktak returns from the garden with a brass pot he has dug up. Soon, the couple discover that anything they place in the pot duplicates itself exactly! So, if you put in a purse with ten gold coins, then you pull out two purses, each with ten gold coins. Of course, the couple gets busy duplicating coins! 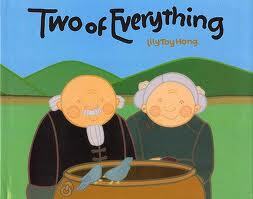 Also, of course, they have an accident and Mrs. Haktak falls into the pot-- making two Mrs. Haktaks! You will have to read the book to find out how they solve the dilemma of having too many wives! Here's how I use it in the classroom. After reading the book I talk to the class about things we need in the room-- like a laptop computer for everyone. Then I pose the problem: If I put my laptop in the pot, how many times would we have to keep putting in laptops to get exactly the number we need- no extras? I also add to the problem this requirement: What would be the smallest number of duplications that would solve the problem--obviously we can just keep putting in one at a time. I divide the students into groups and give each group a large piece of paper and let them go about solving the problem. It's actually trickier than it seems. Thanks Collaboration Cuties for this great link up! This is a new story for me, I'll have to check it out! Thanks for sharing. I'm a new follower. Thanks for sharing. We actually have this story in our reading basal, but I've never used it for a math lesson. Good ideas! I have never heard of this story! Thank you for sharing it! I like the critical thinking that has to be applied! Thank You! 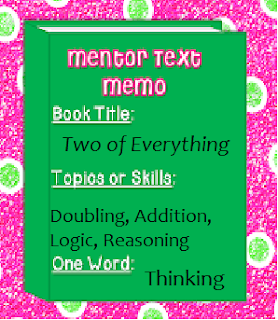 I am learning so much from the Mentor Text link up! Great text! 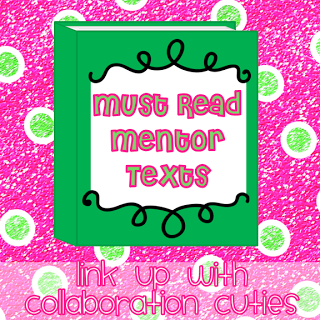 Thanks for sharing... Just came upon your blog with the Collaboration Cuties text link up--glad to have found you! I have become a follower! Love this book! Just used it this week to introduce our doubles unit. I have a 1/2 class in Australia. The kids really got into the story. Its a great book as it's easy to set up differentiated activities for. There are a lot of great ideas around on the net to use with this book.